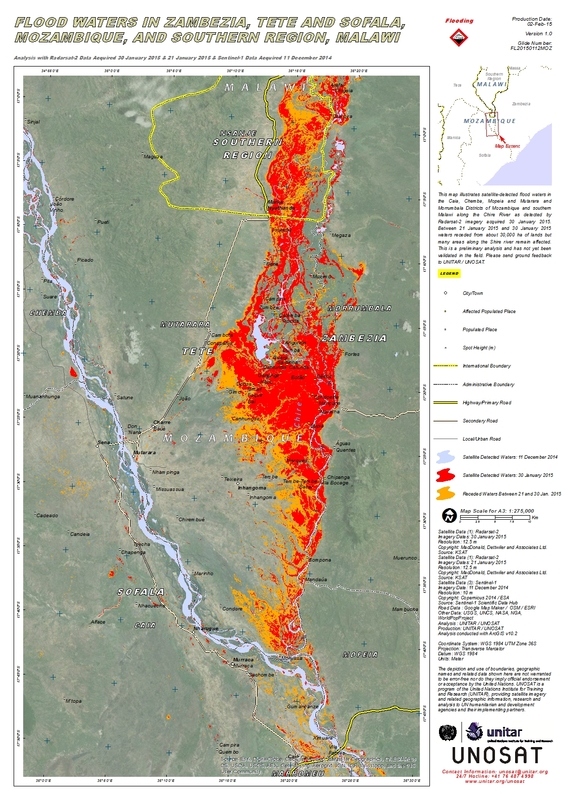 This map illustrates satellite-detected flood waters in the Caia, Chemba, Mopeia and Mutarara and Morrumbala Districts of Mozambique and Nsanje District of southern Malawi along the Shire River as detected by Radarsat-2 imagery acquired 30 January 2015. Between 21 January 2015 and 30 January 2015 waters receded from about 30,000 ha of lands but many areas along the Shire River remain affected. About 22 villages are located within the flooded zone as of 30 January 2015 and according to the World Population data base around 25,000 people are located within these potentially affected a rea s. This is a preliminary analysis and has not yet been validated in the field. Please send ground feedback to UNITAR / UNOSAT. Copyright: MacDonald, Dettwiler and Associates Ltd.